The lubrication of the treadmill deck is probably the simplest thing to be done in order to ensure its long life. There are different types of products for this operation: lubricating oil for treadmills, silicone oil for treadmills and the most convenient - spray. The lubricant is used to increase live of engine and control board, reducing friction between the treadmill deck and the belt (usually white). Silicone oil for treadmill also allows to prevent and reduce any annoying noise that may come from the equipment. How to use the treadmill lubricant? Every week remove the dust and sweat residues from the metal and plastic parts with a damp cloth and wipe a damp cloth with a little silicone spray to make them polish. The drops of sweat from now on will slip on the tubes and there will be a thin protective layer that will prevent them from rusting or opaque. The belt lubrication with the products listed above should be repeated (every 20 hours of use or every 2 weeks), so that it is always a bit greasy when you touch it. Why is it important to lubricate the belt? Regular lubrication can prevent an excessive strain on the engine and control board, which can shorten the breakage. Failure to perform proper maintenance may jeopardize the smooth operation of the treadmill, compromising its future use. Additionally, when the friction of the belt increases, the equipment consumes more energy and consequently increases the cost of the electricity. 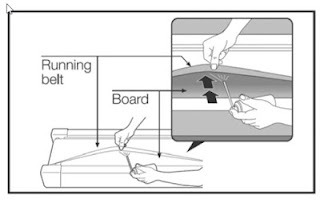 When doing this kind of DIY maintenance, it is also important to inspect the remaining components, such as tightening the screws and, if necessary, drive belt and running belt adjustment, to avoid damaging the treadmill. 1. Raise the left edge of the belt. If the tape can not be lifted, it means it was too tight. Check with an expert because a belt that is too tense can seriously damage other components of the treadmill. 2. Lubricate with three large splashes using a silicone spray bottle (we recommend using Atala - Byte Silic One lubricant). Apply silicone on the deck or at the bottom of the belt (see drawing, do not apply it on the black walking surface.) After the lubrication, remove any excess silicone that should be deposited laterally on the belt. 3. Repeat the operation on the right side. 4. Start the machine and walk for two to three minutes at low speed to spread the lubricant throughout the deck.